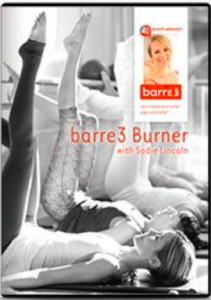 While there are Barre Amped studios are located throughout the U.S., the DVDs allow those who are not near a studio to reap the benefits from their own home. Barre Amped is inspired by dance (though does not require dance) and Pilates to create to create a challenging workout. 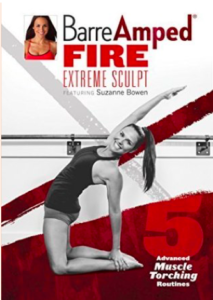 Suzanne Bowen is the founder and creator of Barre Amped and she leads the DVD workouts. There is a whole series of DVD including a prenatal workout for women to stay in shape throughout their pregnancy. This is perfect for those of you who can’t pick your favorite among dance, Pilates, yoga, and calisthenics. However, creator, Tracey Mallett, does emphasize even though there are some dance exercises incorporated that non-dancers should not shy away because the workout is meant for everyone. Ballet Body allows you to get another chance to take class with a celebrity instructor, Leah Sarago this time, from the comfort of your home. In her DVD series, Leah teaches body resistant exercises to strengthen and elongate muscles. You will learn new and creative exercises that will help strengthen your whole body. 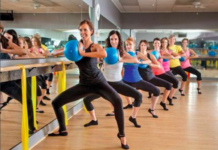 Pure Barre fitness studios are becoming increasingly popular across the U.S. but if you don’t have a studio nearby or would rather work out from home, this program will make your muscles shake from working so hard. You have to dive right into the workout in this DVD and discover muscles you never knew you had! This DVD series offers 57 or 30 minutes workout options. Both options leave the body challenged and help exercisers work towards a leaner and stronger physique. What is great at Physique 57 is that while they are a studio they help people workout from home with DVDs, on demand streaming library, and pre-designed workout plans. This is the DVD for the person who really wants to be in the dance studio, or pretend to be a prima ballerina in the New York City Ballet. Created by New York City Ballet Maser, Peter Martins, and set to classical music, this DVD shares ballet based exercises to strengthen and tone the whole body. Just because it is more traditional ballet though does not mean the non-dancer should shy away! If you are still struggling to find a studio near you, Barre 3 DVDs offer you another opportunity to have a studio based class at home. In addition to their DVD series, they offer online video options as well so there is no excuse not to get the benefits of isometric (small) movements. Finish a DVD and feel your whole body. Bar Method is another trendy and effective barre studio popping up around the country that thinks about those who might not be able to go to a studio class. The Bar Method DVDs let us get a full hour workout or you can opt for the online videos found on their website.